Hi everyone! Even with a wedding in the family fast approaching, I have been giving some thought to Christmas!! 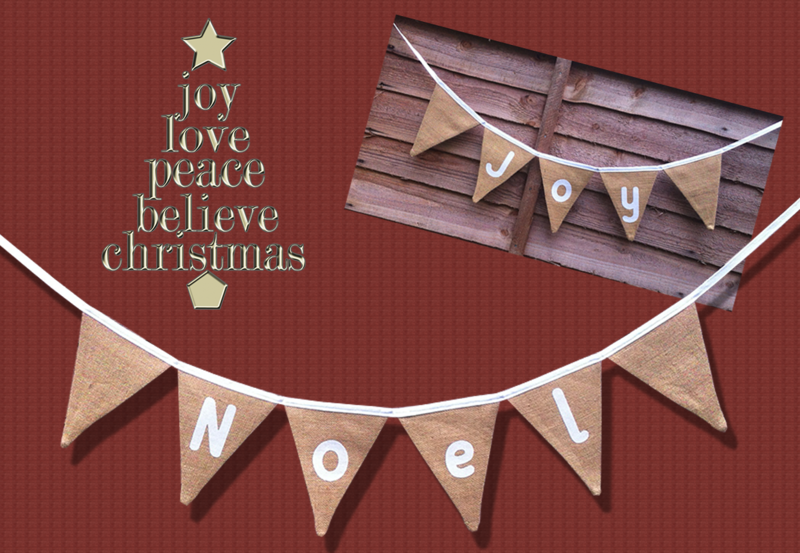 With encouragement from my soon-to-be-daughter-in-law, I have made these hessian banners. Any ‘word’ can be put on there and colours can be easily changed to your preference. Please contact me if you are interested in placing an order. Everyone has their own colour preference and this lady wanted red and gold – very Christmassy! You know how I’ve always said how much I love a challenge well …. 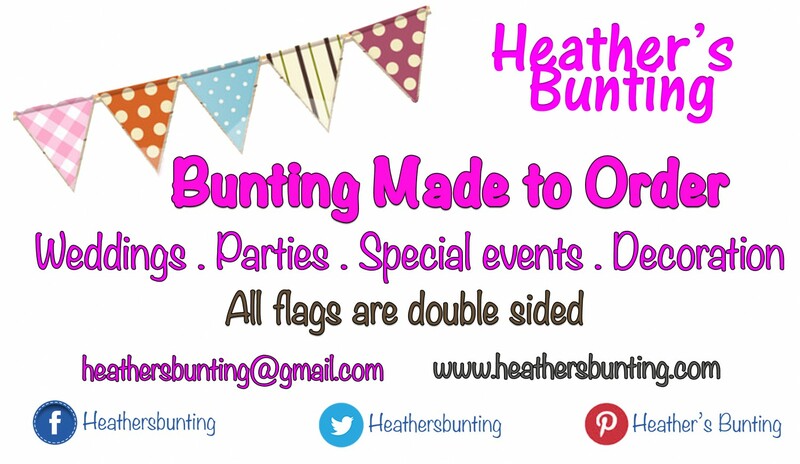 working with mini – bunting and silky fabric was certainly that!! Silver and lace but it was so pretty and every lace flag was different! Sometimes things don’t go the way we hoped they would. My customer had planned to spiral her flags around the tree but they became lost, so hung them overhead instead. She was so excited to see it all, that her tree has gone up in November!! I started off making these flags a couple of years ago, with the idea of producing new advent calendars for my lads but I kinda got bogged down with cutting numbers out of felt!! So, it was suggested to me that I made them up into 3m lengths and sold them! The result of which you can see below. I love a challenge …. once I’ve worked out how to do it!! This applique work was new to me and with the finishing touch of ‘tiny’ red buttons, I loved the result. Having completed 14m for someone, I made one for myself and then another, following a conversation at work. Thinking ahead to next year? …. I have a lot of buttons left!! 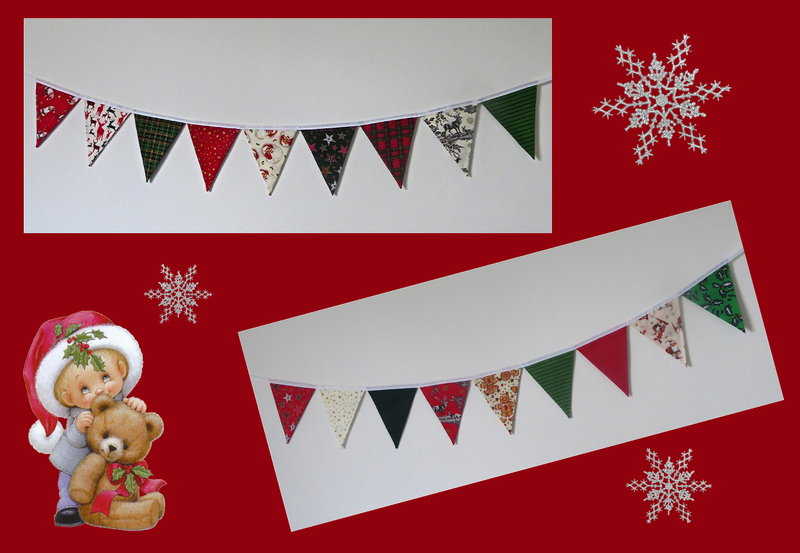 Bunting makes a great gift that can be brought out year after year. My son’s girlfriend had a range of fabric that she asked me to make up for her and ‘Bingo’ her Christmas present was sorted!! 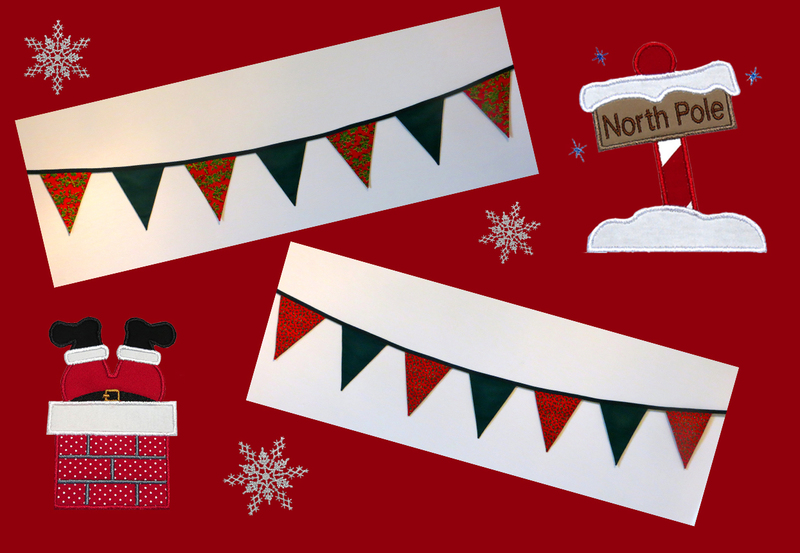 Then, just for fun, I tried my hand at making ‘mini’ banners and I have to say … I am hooked!! Standing at only 7cms high they are tricky to do but a great way to use the off-cuts of fabric.